Roberto Gómez Bolaños is a famous Mexican writer and actor known worldwide mainly for his characters "El Chavo del 8" and "El Chapulín Colorado." He was born in Mexico City in 1929 and studied engineering but never worked in that field. He found his passion for writing screenplays and scripts for television and radio with his work being featured in shows like "Cómicos y Canciones" and "El Estudio De Pedro Vargas." It was around this same time where he gained his nickname of "Chespirito" when director Agustín P. Delgado said he was a "Little Shakespeare" or "Shakespearito." In 1968 he signed a contract with Televisión Independiente de México where he was given a Saturday afternoon timeslot to expose his talent in sketches and comedy. This timeframe proved to be so popular the network moved him to Monday night and the legend was born. 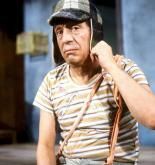 "El Chavo del 8" has been his most recognized character where he plays a homeless kid that lives in a barrel in the middle of an apartment complex. The white humor and the hilarious neighbors like La Chilindrina, Don Ramón, Doña Florinda, Quico, Jaimito El Cartero and La Bruja Del 71 are engraved not only in Mexican culture but throughout Latin America. The show ran for 25 years but reruns are continuously broadcasted with great ratings. In recent years and to revive the "El Chavo" legacy and animated series was created that proved to be successful and has subsequently spawned a line of toys and most recently a go-kart video game.